The Park was established to commemorate those from the district who died in service or were killed in action during World War One. 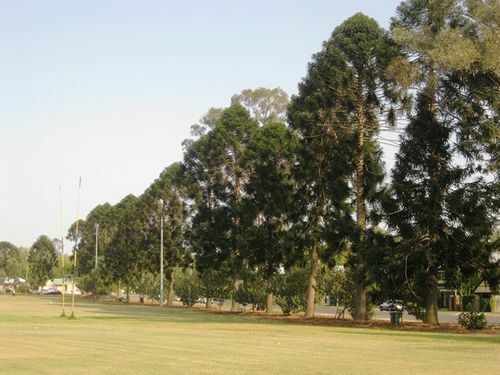 As one of few surviving recreational grounds from the 1880s, this park began and grew with the suburb of Graceville, which itself flourished as a result of the railway station that was established here in 1886. It was after World War One with the outpouring of extreme grief at the losses of so many lives with no chance of home burial that the park was selected as a Memorial Park and a copper memorial scroll handmade by local Ernest Gunderson for the 51 dead Sherwood residents was unveiled (and still stands encased in sandstone and granite). Before the unveiling of the Graceville War Memorial, fifty-two memorial trees were also planted to commemorate the fallen of the district. Bunya pines and cotton trees were set in a single row along Plumridge Street and Appel Street (then called Graceville Parade) to commemorate the dead. Today, twenty-nine bunya pines and eleven cotton trees remain. On the 3rd June 1921, some of the trees were pulled out of the ground as were the memorial crosses which were placed next to the trees. This desecration caused much distress and indignation and a reward of £25 was posted for information leading to the discovery of the perpetrator. Some locals claim that there were memorial plaques on these trees, but that the plaques had gone by the 1950s. In addition to the memorial trees on the western and northern edges of the park, an avenue of bauhinias, cabbage tree palms and Chinese elms was planted either side of a drive from Oxley Road to the memorial. A single line of figs and camphor laurels continued west from the memorial towards Appel Street.